Industrial carts come in all different shapes, sizes, models, and materials, and the S. W. Betz Company has all of these different items available, as well as the product knowledge to help you find the item that you are looking for. 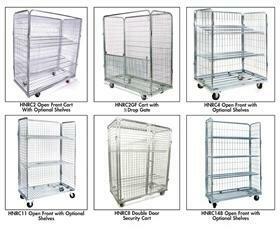 Mobile shelf carts, steel shelf carts, plastic service carts, wire carts, and utility carts are just a few of the many items that the S. W. Betz Company offers in this category. Industrial carts are ideal in many different businesses, including food service, restaurants and bars, medical facilities, and more. The S. W. Betz Company has been distributing industrial carts for some of the top manufacturers in the industry since 1933. We are a preferred distributor in Maryland and the Mid-Atlantic region for Jamco. Jamco is a manufacturer of high quality carts made out of all materials (steel, plastic, etc.) and is located in South Beloit, Illinois. If you are in need of or would like more information about any of our industrial carts, please contact us and one of our team members will be happy to assist you. For more information about Carts or any other product or service from S.W. Betz, fill out and submit the form to the right.